Virginia Beach Patios is a Design-Build company specializing in unique hardscape design and construction. We provide our services to customers throughout the Hampton Roads area. We pride ourselves on quality workmanship and materials that go into everyone of our projects. Whether you are looking for a little curb appeal or a complete outdoor oasis; Virginia Beach Patios has you covered. At Virginia Beach Patios we view ourselves as "Exterior Designers" taking outdoor spaces and making them functional, beautiful and pleasurable. Our exciting new approaches to traditional landscaping challenges; result in a outdoor living space your family can cherish forever. Whatever you have in mind, our amazing creations will help add value to your property…and pleasure to your outdoor living experience. Art and Science are often viewed as being different in so many ways that they appear essentially unrelated. Art is often seen as creative, expressive, experiential, and emotional; Science, as methodical, logical, intellectual, and rational. At Virginia Beach Patios believe in providing our clients the perfect blend of both art and science. The aesthetics of the final product we construct for our clients is equally as important as the engineering used to assure its longevity. Our systematic installation process will ensure the enjoyment of your patio or outdoor living space for years to come. The time we invest to understand the project and our clients vision ensures complete satisfaction. 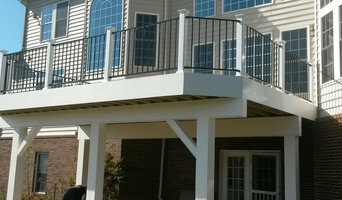 Signature Deck & Pergola Co.
Over 15+ years of deck design and building experience - covering all of Va, Md and Dc area. From small to big projects, we've got your needs covered. If you are looking to build a deck, pergola or screen porch then just email me (Todd Phillips - the owner) and you will be happy you did. I specialize in internet deck design, sales and service that will save you time and money. Fully licensed, insured, Angie List A++ reviewed, quality VA and MD deck contractor. Designing and building the highest quality decks, pergolas and screen porches at the best prices around. Payments are $0 down and no deposit ever (big believer in never giving a contractor money up front) All design work, pull the permit, order and have all the material delivered to your house. At that point you pay for the material with a check or credit card (this is payment #1). Labor payments start as we get things done and after the county inspector passes the footing, framing and final inspections. 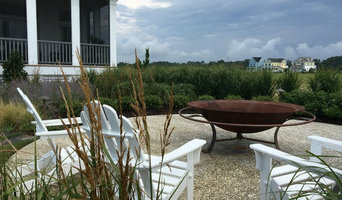 Landscape design and build in the mid Atlantic, Eastern Shore and Hampton Roads Jeff Klingel has been growing, designing, and planting landscapes for 24 years. He has a degree in landscape design from the art institute of Atlanta. In 1999 he and his wife Laurie established Appleseed Nurseries in Eastville, VA. Whether it’s a graceful entryway that inspires you, a patio or pool that creates the perfect ambiance for social gatherings or a tranquil backyard retreat to relax and recharge, striking landscapes can have a dramatic impact on the value and appeal of your home or property. 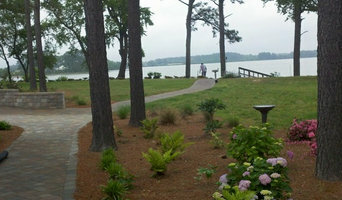 Winesett Nursery has been designing and installing outdoor projects in Virginia Beach and Chesapeake for over 30 years. Cleanlines, subtle textures and dramatic focal points are the hallmarks of a "Winesett Landscape". We offer a wide variety of services including landscape installations and renovations, perennial gardens, fences, decks, outdoor lighting and water features. We also install flagstone paver patios, walkways, driveways as well as irrigation installation services and drainage systems. You can trust in our experienced crews to ensure timely installation and attention to detail. We are a Class “A” licensed contractor and insured in the state of Virginia. Serving the Eastern Shore since 2003, Browder-Hite has quickly grown to become one of the Shore's largest landscape companies. Focused on enhancing, maintaining and protecting the area's timeless properties, we strive daily to live out our motto, "The Difference is Visible." Learn more about our president and founder, Benjamin Lewis, as well as landscape design director Kimberly Allen by going to our website. ProVivid Home is a company that specializes in Travertine pavers installation for your pool decks and patios and Venetian plaster installation for your interior decoration needs. Williams Landscape and Design wants make your landscape dreams a reality. Our professional staff is ready to help home owners accentuate the beauty of their property. We offer extraordinary landscape design ranging from custom arbors and pergolas to landscape lighting and retaining walls. At Williams, the emphasis is on individualized customer service. Our focus is on quality landscape projects, not quantity. This focus allows us to cater to your unique landscaping needs. Our landscape designers are Virginia Society of Landscape Designers certified. Each property has its own particular needs which we take into careful consideration. We do small landscape renovations that enhance the beauty and value of homes, as well as large difficult landscape projects that require extensive planning and precise execution. Founded in 2001, Williams Landscape & Design, Inc., has been serving the Williamsburg community for many years. Residential Landscape Design/Build work is our specialty with some commercial work we have been invited to contract. Proudly serving Williamsburg and surrounding areas, WLD, has participated in many community based activities, such as, United Way’s Day of Caring, winning several Parade of Homes awards, rebuilding/remodeling Colonial Williamsburg’s Merchant Square, and Jamestown’s Festival Park Anniversary Garden. From Concept, to Design, to Reality we create an inviting oasis that caters to our client’s lifestyle. Call us today to see how our designers can transform your yard into the ultimate leisure setting. See why we are the best design/build landscape company in the greater Williamsburg area! We have been honored with many National and Local awards for our landscapes and hardscapes over the years. We look forward to serving you in your landscape. At Ultimate Hardscapes we specialize in the design and installation of exquisite outdoor living environments using hardscapes. 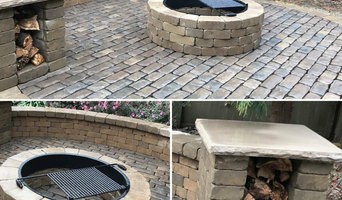 From our simple patio and fire pit installations to our award winning showcase projects, we have the ability to take your project from planning to completion. We understand and value the trust our clients place in us, therefore, we are committed to not only deliver a quality project but and exceptional experience with each person associated with our company. Berkeley Design Group is a Williamsburg based landscape design firm serving Williamsburg, Richmond and Hampton Roads. Our company was founded in 2007 and is the vision of Mike Turkovich who works personally with each and every client throughout the entire design process. We specialize in the design and implementation of truly unique and highly detailed custom landscapes which reflect exacting standards and an unparalleled attention to detail. Berkeley Design Group is at the forefront of paving stone installation. We enjoy what we do, are constantly striving for excellence and warranty our work from the ground up. We believe that as people become aware of the superiority of a segmental pavement and that as we continue to require our customer's overwhelming approval of our installations, Berkeley Design Group will continue to be a dynamic leader in an expanding industry. What sets us apart? We exceed the expectations of our clients through our expertise, “hands-on” involvement in every step of the process, and unyielding dedication to customer satisfaction. “Your Dreams We Create Together.” Please call for a free consultation, estimate and references. The grass is greener with our customer service. Dependability, responsiveness, and a friendly smile. We provide a refreshing experience to the greener side of landscaping and lawnscaping with our services. We at Double or Nothing Lawnscapes answer your calls with an inviting "How may I help you?" to guarantee your needs are addressed and cared for. We offer the accessibility to contact us through emails, texts, and social medias, (ex. Facebook), to ensure you are completely able to get in contact with us, using your preferred method of communication. We promptly reply and inform you of appointments we have made with you, calling a day in advance to check for your availability and or approval. Our team is friendly and considerate of you and your property. We proudly wear our uniforms to represent the team of Double or Nothing Lawnscapes and to be identifiable while on your property. We locally provide commercial and residential services in Carrollton VA, Yorktown VA, Poquoson VA, Newport News VA, and Hampton VA. We would love for you to join our family to be able to experience the greener side to landscaping and lawnscaping, with reliable, friendly care of you and your lawn. Dr. Dan's Landscaping & Architectural Design is a family owned business in Virginia Beach. For over twenty five years, we have designed and installed exceptional exterior design projects for area homeowners. We take pride in exceeding our clients' expectations with genuine, caring and personalized service. With an eye for detail and a passion to create, we take your dreams and transform them into reality. Each year we participate in area Home, Garden and Flower Shows to offer the current trends in the industry. The Dr. Dan's experience begins with a complete consultation with one of our professional designers. Always Owner/Manager supervised, a uniformed crew of skilled craftsmen will ensure the highest level of quality, professionalism, and integrity on each project. From start up to walk thru, we handle the first call to Ms. Utility, manage & coordinate to perfection, take final photos and advised you on aftercare to ensure you receive years of enjoyment from your investment. Our goal is to make certain that you have every reason to come back to us for your future projects. We strive to build that important lasting relationship with our clients, and we do this by offering customer service that is unmatched in this area. 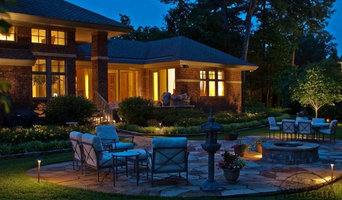 Accent Lightscaping is a creative Portsmouth landscape lighting company. We feature designs that spotlight delightful gardens, patios, and walkways. Please give us a call today. Accent Lightscaping is dedicated to customer satisfaction. Bringing you the highest quality products, with innovative designs to custom fit your needs. We might be a small business but have big ambitions and look forward to doing business with you in the near future. More than just making your neighbors jealous, a beautifully landscaped yard can maximize your outdoor living space and make your home feel like a castle. Having a professional landscaper design your yard is also one of the most cost-effective ways to raise the resale value of your home! Whatever your reason for choosing professional landscaping, you came to the right place. At Accent Lightscaping, we are a full-service landscaping company dedicated to providing homeowners in Accent Lightscaping with the lawns of their dreams, at prices that won't break the bank. Specializing in landscape design, we have the skill-set and expertise to execute every job to your complete satisfaction, and we won't settle for anything less. We have worked on a wide range of residential and commercial projects, and our goal is to provide complete customer satisfaction on every job we take. With an arsenal of state-of-the-art landscaping equipment and an expert team committed to creating immaculate landscapes, we are the one-stop resource for all your landscaping needs. So whether you're considering some new plants or a completely renovated landscape, count on Accent Lightscaping to create a customized solution tailored to your individual needs and budget. You can rest assured that we will never add any hidden fees to your bill and that the initial quote you receive will be the all-inclusive end price. For more information or to receive a free consultation, please contact us today. Dream Decks LLC redefines outdoor living through the installation of outdoor home improvement projects with the utmost quality and customer service. Who We AreReimagine your yard with Aubrey's Landscaping and Tree Service. Since 1999, our landscaping company has been providing total landscape design services, sprinkler systems, and tree removal services to both residential and commercial clients. You'll appreciate the promptness of the work provided by our fully licensed and insured company. We have a large enough crew to be able to respond quickly to your needs and all the equipment to handle large jobs. All jobs are owner-supervised to ensure the best possible quality of service.